Tori Thistlethwaite had completed her English degree and was ready to jump into a career. But in the competitive job market, she needed to differentiate herself from other job seekers. Originally exploring journalism, Tori looked at UFV’s Public Relations program as a way to gain more flexible expertise that would give her an edge in a variety of industries. However, while she had always had a passion for writing, she had never been comfortable with another key component of PR — public speaking. In addition to learning directly from experienced industry professionals and building her skills in speaking, writing, search engine optimization, social media marketing, press releases, working with the media, and much more, Tori benefited from UFV’s practicum program. She completed her practicum at Leavitt Machinery — an innovative local company that has stretched internationally and was looking for local people to help drive their business forward. Being part of a growing company is exciting for Tori, and her employer is also excited about the great skills she brings to Leavitt. 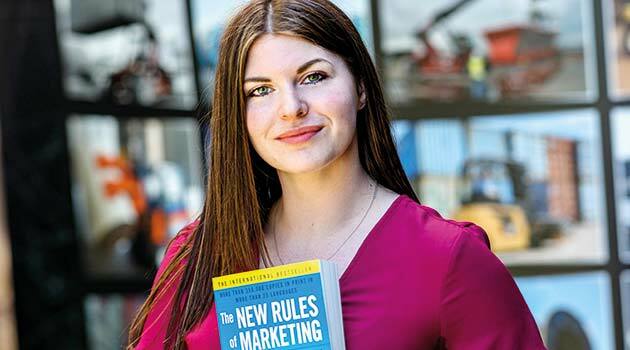 “She’s done a good job of understanding our various business brands and what they offer — and then providing effective marketing for them,” says Todd.